Today, Final Fantasy XIV Companion finally became available on Android and iOS. As someone who plays a whole lot of FFXIV, I knew I'd be poking at this thing eventually, and here's what I found. As expected, the app is currently struggling with congestion-based server issues, so it'll take some work to log in and attach it to your account. I was able to get in after about four tries, and from there, everything seemed to work as intended. Since then, I've been able to close and reopen the app with zero issues. The bulk of the companion app experience is communicating with your in-game associates who also have the app installed. This means that if you have friends in FFXIV who do not have the app installed and attached to their character, you cannot reach them through the app. It's a major detail that isn't exactly clear when you first start using FFXIV Companion, especially if you're planning to send your sleeping girlfriend dumb messages like "I sent this FROM MY PHONE O_O". Conversations can be filtered in the ways you'd expect. There are tabs with contacts from your friends list, linkshells, free company, and chat groups set up within the app, in addition to one tab combining all of these. The other main communication tool is the Events feature. Just going off the limited experience I've had with it so far, it does what one would expect. You can schedule events and invite contacts to them. There does not appear to be a way to get the app to notify you of an active or upcoming event, which is a pretty large oversight. I assume this will be addressed in the future. 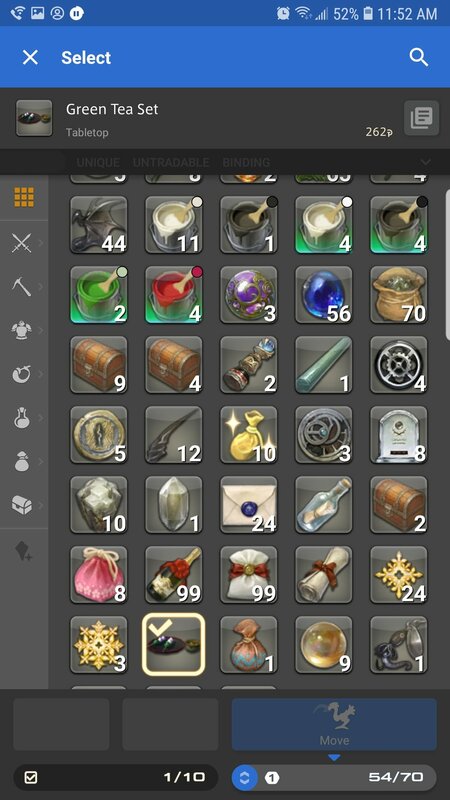 Your FFXIV inventory is accessible through FFXIV Companion... with some caveats. I was able to sell items to an imaginary NPC vendor from my character's item bag, view items in all my inventories (saddlebag, retainer, etc. ), and dabble with the market board. Any time an item is highlighted, there's a button at the top right of the screen that will pull up a description from the game's official database, which means this app performs some of the same functions as the super useful FFXIV Libra app. There's also a quick buyback that works like it does in the game. The first caveat to this system comes from interacting with retainer and saddlebag inventories. Without the premium version of the companion app, which currently doesn't exist (more on that later), it is not possible to move items across item bags. That's not a particularly huge problem, as I can't imagine many scenarios where players would find it absolutely necessary to shuffle items around outside of the game, but since there's a big button on screen to move items, it's worth noting that it can't be done right now. In the free version of the app the Buy and Sell menu options connect to the market board. The Sell option allows listing items for sale from any/all inventories, and provides the features you'd get at the in-game MB, including the item's sale history. It also conveniently displays the sale history on screen while you input the selling price for your items, which is something I actually would like to see in the full game. Buying items is similarly smooth sailing. The app offers all the item categories you're used to seeing on the board, and allows filtering by level, class, and so on. However, this is also where most of the caveats come in. First, there's no actual item search for the Buy option. Not being able to text search the market board is a huge quality-of-life issue. It's entirely limited to the categories you'd see under the search bar in-game, which people use far less often than the text search. Second, the app's monetization systems impact market board transactions significantly. In case you weren't aware (we covered the specifics here), the app awards users one Kupo Nut per day, as a daily login bonus. 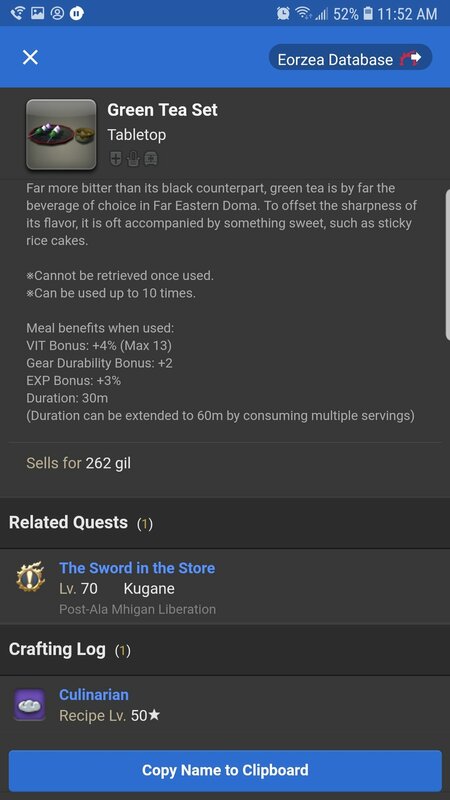 Kupo Nuts are tokens you spend each time you post or buy an item on the market board, and users of the free version of FFXIV Companion can hold a maximum of two. This helps remove concerns that the sharks of the FFXIV economy will now be able to further dominate the financial world from outside the game, and it probably helps Square-Enix with the app's operational costs as well. However, it also makes the app feel terribly money-grubbing. What might be the most useful feature in the whole thing, is limited to one or two uses per day, without coughing up some cash. Even if most of us players wouldn't use it more often than that (especially considering the obvious-but-easily-forgotten point that we can still do all of this in game, like we have for the past five years), it still stings a little. I'm no consumer psychologist but maybe giving two Kupo Nuts per day, and setting the max to four would help? I don't know, but either way, there's going to be backlash over this. When the premium version of the app becomes available, it'll provide perks like more daily Kupo Nuts and an additional chocobo saddlebag for a currently undisclosed monthly fee. Meanwhile, the companion app currently generates revenue by allowing users to purchase Mog Coins, which perform the same tasks as Kupo Nuts. 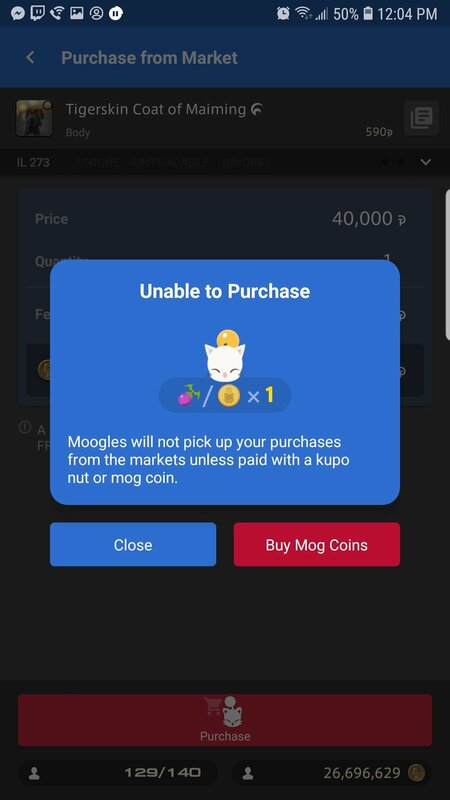 Mog Coins can only be bought with real money. The current rate is 5 Coins for $1 USD, with bonus coins for purchasing larger quantities. It's a nice workaround in the event someone does need to do more than two market board transactions in a day, and can't log in. It also opens the door for someone with lots of disposable cash, a dastardly scheme for the in-game market board, and very little morals to abuse the app and rake in some gil. It's extremely unlikely, but it is possible. Overall FFXIV Companion is unsurprising, in a good way. The feature set feels like it checks all the necessary boxes, and the interface is mostly easy to use. Some of the icons could certainly bear explanation, like the one in the Buy menu that enables/disables your search filters, but things mostly do what you'd expect. It's telling that throughout writing this, I've struggled to avoid writing the unintentional pun of "It's a great companion to FFXIV." That's an accurate way to describe it, though, and for the cost of free, it's worth the storage space. Oh, and it's worth mentioning that the app can't be used to access your inventory or the market while logged in to the full game. If you go into those parts of the app while playing FFXIV, you'll get a prompt with the option to log you out of the game. If you're fiddling with your inventory in the app and you then log in to the game, the app will get an error and disconnect. So there's a little bit of science you don't have to do. Got friends who may be interested in the FFXIV Companion app? Share this article!